How wonderful to celebrate your love and committment now that some time has passed! You may want to renew your vows to mark a special anniversary, or you may simply want to speak your vows again. You may have had a registry office service and now want a personalised ceremony of your choice. Perhaps you were married abroad and wish to have a ceremony with friends and family in this country. You may have been through a challenging time in your relationship, or in your health and simply want a ceremony to acknowledge how you’ve come through this and are reconnecting and looking forward again. Perhaps one partner may not have long to live…in this case a renewal of vows can be deeply moving and can be a beautiful, sensitive ceremony. I will work with you to create a unique, inspiring ceremony to celebrate the past, the present and the future of your marriage. There are no legalities required for renewing your wedding vows, so the location of the ceremony can be held anywhere you choose. 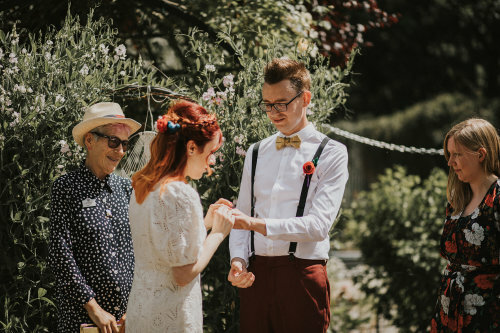 Cost: £395 This includes home visit, telephone contact with celebrant, draft ceremony for checking, order of ceremony agreed, friendly support, professional delivery of service in venue of your choice, your own written copy of ceremony.